As the progressive movement continues to support a variety of campus clubs, activities, and organizations, a push for more opportunities for women has led to another win for the University of Cincinnati community. The Greater Cincinnati Foundation has invested $25,000 in UC’s The Cincinnati Project to support activities that benefit women of color. The Cincinnati Project, a community-engaged research initiative at the University of Cincinnati (UC), will use the funding to support projects that offer clear and direct benefit to women of color in Cincinnati. The Cincinnati Project was launched in 2013 by faculty researchers in UC’s College of Arts and Sciences. The group focuses on research, with resources provided by the university and various Cincinnati organizations, that will directly benefit the community. The reach of The Cincinnati Project work spans from research related to poverty and living conditions in Cincinnati to classroom skills that are transferable to real-life situations and employment opportunities. With the growth of the University of Cincinnati as well as the ever-changing demographic of the Greater Cincinnati area, this research is important in developing new policies and habits that will bring positive change for the community. 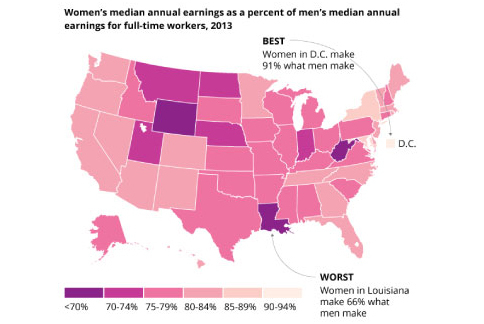 A closer look at median earnings for women in 2013 provided by The Cincinnati Project. 25 community organizations have collaborated with UC researchers and 340 UC staff, faculty, and students have participated in the work of the Cincinnati Project since 1/16. More than 12 University of Cincinnati faculty and students from their classes will be involved in these upcoming projects. The funding received has been slotted to go towards several research areas within The Cincinnati Project. It will support upcoming projects including public relations research and messaging recommendations for organizations and businesses run by women of color; summaries of U.S. Census data for Housing Opportunities Made Equal (HOME) for its work on tenants’ rights; documentation and storytelling of women of color who own businesses or are activists in Cincinnati; and sharing findings from research on gender and race equality in city employment, part of the Cincinnati for CEDAW (Committee on the Elimination of Discrimination against Women) Coalition. As for future goals for The Cincinnati Project, members hope to create a course designed to teach students about the three research focuses (classroom, collaborative, and translational) of The Cincinnati Project, develop more partnerships with community organizations, fund an academic research infrastructure program, and promote further research and innovation in methodologies for evaluation. For more information about The Cincinnati Project, visit http://thecincyproject.org/ or head to their Facebook page.